Japanese punctuation (Japanese: 約物, Hepburn: yakumono) includes various written marks (besides characters and numbers), which differ from those found in European languages, as well as some not used in formal Japanese writing but frequently found in more casual writing, such as exclamation and question marks. Japanese can be written horizontally or vertically, and some punctuation marks adapt to this change in direction. Parentheses, curved brackets, square quotation marks, ellipses, dashes, and swung dashes are rotated clockwise 90° when used in vertical text (see diagram). Japanese punctuation marks are usually full width (that is, occupying an area that is the same as the surrounding characters). Punctuation was not widely used in Japanese writing until translations from European languages became common in the 19th century. 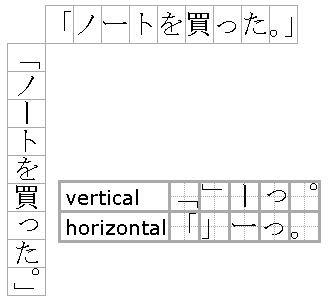 Diagram showing differences in placement of punctuation marks in vertical and horizontal writing, in a sentence containing hiragana, katakana and kanji. Various types of brackets (括弧, kakko) are used in Japanese. As in English, brackets are used in pairs to set apart or interject text within other text. When writing vertically, brackets are rotated clockwise ninety degrees. Each bracket occupies its own square when using genkō yōshi. Sumitsukikakko (隅付き括弧, ink-filled brackets), also known as lenticular brackets. Lenticular brackets are also used as quotation marks in the Japanese language. The comma (読点, tōten) is used in many contexts, principally for marking off separate elements within a sentence. In horizontal writing, the comma is placed at the bottom right of the preceding character. In vertical writing, it is placed immediately below and to the right of the last character, in a separate square if using genkō yōshi. In horizontally written manuscripts that contain a mixture of Japanese and Western characters, the full-width comma may be incorporated as well. No extra space is left after a comma. Ellipses (リーダー rīdā (leaders), 点線 tensen (dotted line), or てんてん ten-ten ("dot dot") indicate an intentional omission or abbreviation, or a pause in speech, an unfinished thought or, at the end of a sentence, a trailing off into silence (aposiopesis). Ellipsis was adopted into Japanese from European languages. The ellipsis is often three dots or six dots (in two groups of three dots), though variations in number of dots exist. The dots can be either on the baseline or centred between the baseline and the ascender when horizontal; the dots are centred horizontally when vertical. In manga and visual novels, the ellipsis by itself often represents speechlessness or a "pregnant pause"
Unlike the Western full stop, it is often used to separate consecutive sentences, rather than to finish every sentence; it is frequently left out where a sentence stands alone, or where text is terminated by a quotation mark instead. No extra space is left after a full stop. In manuscripts that contain a mixture of Japanese and Western characters, the Western full stop may be incorporated as well. Good Person. (いいひと。, Ii Hito), a manga by Shin Takahashi. Ecomoni. (エコモ二。), a Japanese pop group from Hello! Project. Nobuta. O Produce (野ブタ。をプロデュース), a drama series (dorama), produced and aired in 2005 by NTV. Your Name. (君の名は。), a 2016 Japanese animated romantic drama film written and directed by Makoto Shinkai. The interpunct ・ (中黒, nakaguro, "middle black") or "katakana middle dot" (as the Unicode consortium calls it) is a small dot used for interword separation. It is also known as nakapochi, nakapotsu and nakaten. It has a fixed width that is the same as most kana characters. The part alternation mark 〽 (庵点 ioriten or 歌記号 utakigō) is used to indicate the beginning of a song, or the beginning of the next player's part. It was most common in Noh chanting books and Renga (linked verse). In Noh books it is used to mark the beginning of each character's (or the chorus') parts. The opening square quotation mark (「) may also be used. Double quotation marks (二重鉤括弧, nijūkagikakko) are used to mark quotes within quotes: 「...『...』...」 as well as to mark book titles (Japanese does not have italic type, and does not use sloping type for this purpose in Japanese). They are also used sometimes, in fiction, to denote text that is heard through a telephone or other device. 1. 3 spaces before the title. 2. 1 space between the author's family name and given name; 1 space below. 3. Each new paragraph begins after a space. 4. Subheadings have 1 empty line before and after, and have 2 spaces above. 5. Punctuation marks normally occupy their own square, except when they occur at the bottom of a line, in which case they share a square with the last character of the line. A space (　) is any empty (non-written) zone between written sections. In Japanese, the space is referred to by the transliterated English name (スペース, supēsu). A Japanese space is the same width as a CJK character and is thus also called an "ideographic space". In English, spaces are used for interword separation as well as separation between punctuation and words. In normal Japanese writing, no spaces are left between words, except if the writing is exclusively in hiragana or katakana (or with little or no kanji), in which case spaces may be required to avoid confusion. In Japanese, a single space is often left before the first character in a new paragraph, especially when writing on genkō yōshi, and a space is left after non-Japanese punctuation marks (such as exclamation points and question marks). A space may be left between the family and given names as well. When the character is not easily available, a direct HTML equivalent is the &emsp; entity (em-space) which outputs the same fullwidth " " glyph. A fullwidth space may be used where a colon or comma would be used in English: 大和銀行　大阪支店 (Yamato Bank, Osaka Branch). The wave dash 〜 (波ダッシュ, nami dasshu, wave dash) resembles a lengthened tilde (FULLWIDTH TILDE), which does not exist in JIS X 0208. To separate a title from a subtitle on the same line; in English a colon is used for this purpose. The Japanese versions of these punctuation marks are usually full-width characters. A full-width space is usually left after such marks when writing in Japanese. The colon (コロン, koron) consists of two equally sized dots centered on the same vertical line. As a rule, a colon informs the reader that what follows proves, clarifies, explains, or simply enumerates elements of what is referred to before. Although not a native Japanese punctuation mark, the colon is sometimes used, especially in academic writing. As in English, the colon is commonly used in Japanese to indicate time (4:05, instead of 4時5分 or 4分5秒) or for lists (日時:3月3日 4時5分 Day/time: March 3, 4:05pm). The exclamation point or mark (感嘆符, kantanfu) is usually used after an interjection or exclamation to indicate strong feelings or high volume, and generally marks the end of a sentence. A sentence ending in an exclamation mark is either an actual exclamation ("Wow! ", "Boo! "), a command ("Stop! "), or is intended to be astonishing in some way ("They were the footprints of a gigantic hound!"). While there is no exclamation point in formal Japanese, it is very commonly used, especially in casual writing, fiction and manga. In formal Japanese, no particular symbol is used to mark interrogative sentences, which end with the normal Japanese full stop (。). However, the question mark is very commonly used, especially in casual and creative writing and in manga. It is generally known formally as 疑問符 (gimonfu) or less formally はてなマーク (hatena māku), but the katakana form of "question mark" (クエスチョンマーク or クエッションマーク) is also common. This sign is added to the tail of a phrase, indicating it is a part of lyrics or someone is singing the phrase. For a list of words relating to Japanese punctuation marks, see the Japanese punctuation marks category of words in Wiktionary, the free dictionary. Chinese punctuation, which uses a similar set of symbols but with some differences. ^ "感嘆符・疑問符の後の全角空白は本当にJIS由来？ 中の人に聞いてみたよ " [Does the full space after exclamation points and question marks come from JIS? I asked a person who knows.]. densho-chaneru. 14 November 2014.